SPEAR will be teaming up with True Beauty Salon & Medispa to bring an evening of beauty as well as a talk and charity raffle for SPEAR. 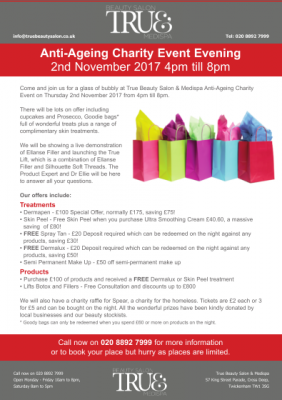 Where: True Beauty Salon & Medispa, 57 King Street Parade, Cross Deep, Twickenham, TW13SG. Tickets are £2 each or 3 for £5 and can be bought on the night. 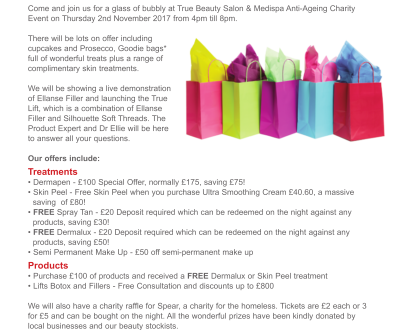 All prizes have been donated by local businesses and True Beauty & Medispa’s beauty stockists.